About two weeks ago we posted about the latest Google Maps update that added a new lane guidance feature to its iOS and Android versions. Version 3.0.0 for iOS has the feature and it works quite well. The only downside is that Google Maps is not AppRadio compatible. Gone are the good ol' days when those were the default maps for iOS and in turn on the AppRadio. Ever since Apple introduced their own maps application, things have not been the same. I usually use Apple Maps just because most address links from either my contacts list or an email end up launching Apple Maps. If you use Safari to Google for a POI or an address however, Google Maps launches when you click an address link. But my days of using Apple Maps may be numbered because on the same trip that I discovered lane guidance on Google Maps, Apple Maps wanted to take me to the wrong location I had entered in San Francisco. I was almost late for a meeting but thankfully Google Maps saved the day. Google Maps is definitely the better map app for navigation. Additionally it works better overseas too, compared to Apple Maps. There are a few horror stories of people in Australia ending up at desolate locations instead of bustling neighborhoods when going by Apple Maps. In CarPlay, Apple Maps will be the default maps app. At least for now. 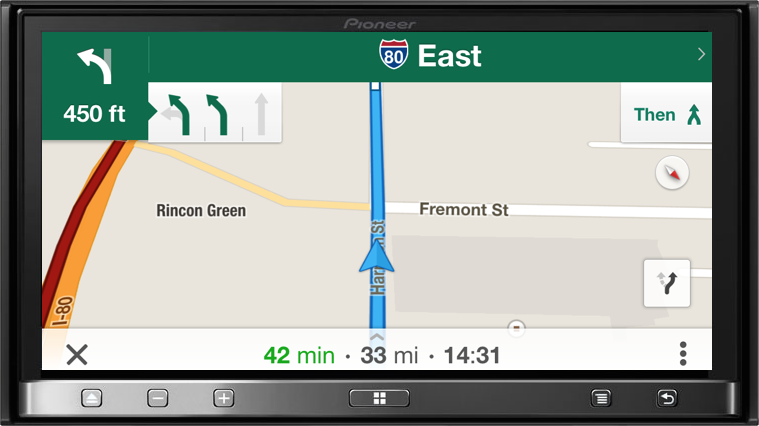 We will see if they will allow apps like Google Maps to be used in CarPlay. Hopefully Apple will continue to improve their Maps and straighten out the existing kinks. iOS 8 might read a different story but for now I am sticking to Google Maps. If only it were AppRadio compatible, that would be the icing on the cake. Note: The image above is simulated.